Saturday was Daughter's birthday - 16, I weep to say, but we'll get to that. She had friends fore and aft in the day, but the afternoon was for family, and so we went to see Star Trek XIII or V.2 III, whichever you prefer. I had been expecting a middling outing. Little publicity running up to its release, which seemed . . . ominous. The choice of a bro-flick action director. The few things I'd seen in the trailers which made me wince - a motorcycle? Really. Okay. Generic-peril-type situations. Well, if it's bad, then this is done and we can either move on to the TV show or hope they make a 4th one that's better, or I can grow up. 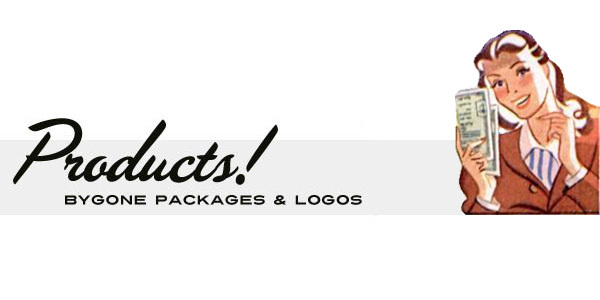 Okay, I'm going to give away some things that happen. Not the twists, or the ending, or any of that. Because why would you want to read that? But there is something we have to discuss, because it bothered me. Space . . . I mean, there's space now so you don't have to see the remarks. You can click here to jump to the end of the Trek stuff if you wish. Okay, space . . . They destroyed the Enterprise. I hate this. I don't necessarily hate it as a plot device - they trashed the hell out of the E at the end of the last one - but I hate to watch it. The Enterprise is a character, and it's like watching a beloved character get torn apart, limb from limb. It's harrowing. I don't even like to see the ship damaged, because it's the Enterprise. Except . . . it's not. There was only one, and that was the original. One of the reasons I hate to see it destroyed is because I'm still thinking of the early days, when the Constitution class was rare. Starfleet seemed to be much smaller in the original series, and there were only, what, a dozen? Fourteen in the class? Two were damaged, one lost. When the original was destroyed in ST 3, it was a heartbreaker. When the D was destroyed, it was spectacular, and a shock - we didn't expect the first movie to end like that. The landing of the saucer was a great sequence - everyone holding on, teeth chattering, no music, just the rattling noise of the saucer sliding through the forest. And I thought - well, they can fix it! Get a new engineering section, it'll be ready for the next movie. (And I wish it had been; I wasn't a fan of the Sovereign class.) But no. The destruction of the Enterprise comes early in the movie, and it's gob-smacking. If you're going to do it, that's how you do it. The ship is literally shredded to pieces, and fights all the way. It's unrelenting - and has a final moment from Kirk's perspective that's heartbreaking. Removing the ship from the story (although it does enter in the plot again, albeit in corpse form, a sequence that makes the Enterprise a tool, not a comrade) has the effect of removing a staple of so many shows and movies: the ship shows up and saves the day. Something that was broken is fixed at the last moment. Damaged but still vital, she punches her way out of a fix. Flies away just as something explodes. And so on. It lets the story focus on the characters, and the middle part of the movie is all characters, in pairs, being exactly who you want them to be as good as you've ever seen them be. Spock is different, but damn, he's Spock. Bones is burly Bones, bigger, but he's even more Bones than Bones was. Sulu is cooler than the original Sulu, because he doesn't do the Takei-wide-eyes look; this Sulu narrows his eyes, and while that may be the entirety of his character, it speaks a stack of data solids. Uhuru is entirely different, though; she makes the Nichelle Nichols version look like a receptionist. Chekov - ah, it breaks your heart, because he's dead and won't be back. There's more Chekov in this movie than all the other TV shows and movies put together, and he's bright and engaging. Pine as Kirk - well, it's interesting to consider how he's shed the brashness of the first film;. He had to. The swagger has been replaced by a certain weariness, which he has to shed as well. So all that's good. But how the hell are they going to stop the bad guy? (Leaving aside the fact that the movies don't have to have a bad guy. I wis they didn't have to have a bad guy.) That's where it gets really satisfying, because - of course! - they find an old, old ship, and all the beats from so many shows seem to echo through the resurrection and outfitting of the Franklin. The thing that annoyed me the most about the first one - the anachronistic music in the opening scene - is replayed for the climax, and it works - and that's the sort of thing I usually hate. I didn't hate it because I had gone into the movie thinking: it might be medium-strength, but I'm not here to have a bad time. I want to enjoy myself. Unbuckle. Relax. Be ready to forgive. That goes a long way in any situation, and it's probably one of the reasons I had such an excellent time. Also: It's not so hard to build Starships when you have matter-replicator technology, and there's no scarcity of material. Hell, there's practically a big machine that makes them automatically, as we see at the end. I'm not always susceptible to the Inevitable Coda, the scenes that giveweveryone an Emotional Moment for the sake of winding down the movie, but this one had a punch at the end that was just . . . oh, my. I don't know if it's the best of the nuTrek - the first one just knocked me out (although in retrospect, most of the stuff with Nero is just okay), and the second I still regard higher than some. (I do not understand the hate for it. Quarrels, yes, but hate? ) But as a straight-ahead Trek movie that proved everything will work if you let it, it might be the most successful over-all. To quote the worst line in the Star Trek movies: It was . . . fun. By the way, I'm supposed to interview Shatner this week. 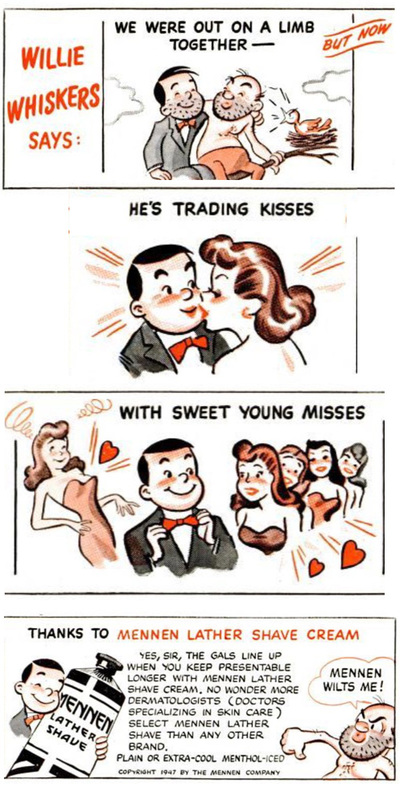 A look at some tiny pictures in an ad designed to let gals know the score. Now that the world's enflamed wth conflict and conscription. He's been in trenches with guys for nine months and he wants to see some legs. Preferably two. At this one point would be nice. 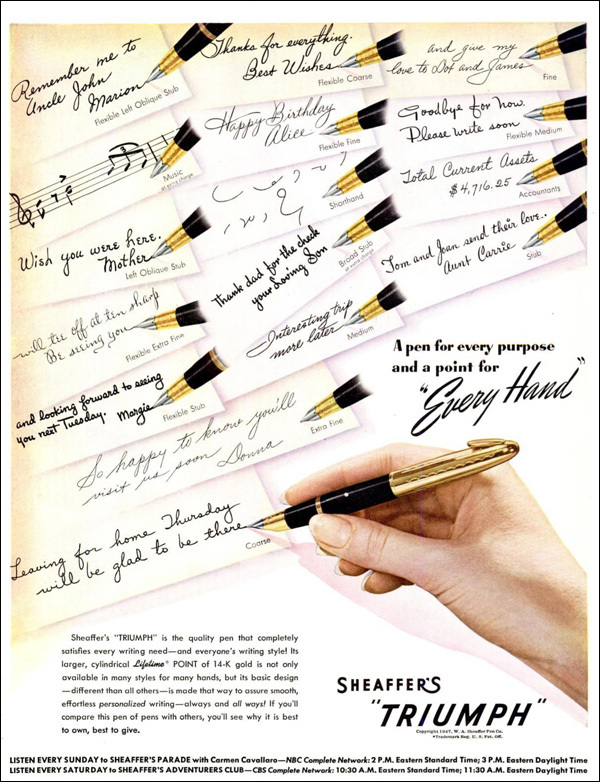 In May 1942, just five months after the bombing of Pearl Harbor plunged the U.S.A. into World War II, the company produced a short motion picture for its dealers, to announce Sheaffer’s “TRIUMPH” — the new line of pens the company had created for its conical nib. I'd love to show you that film, but we've only this workmanlike Jam Handy short from 1943. Once upon a time there were traveling pen salesmen. Love the name of this fan: VORNADO. New Yorkers may think - hey hold on, that's also the name of a property management company, isn't it? Yes. 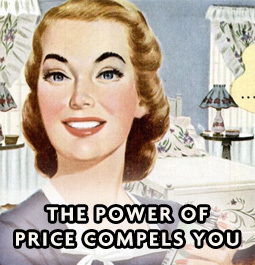 A discount chain called Two Guys bought the Vornado manufacturer n 1959. Then they went into real estate. Now it gets fun. Bonus: walk-on by the Donald. In 1986, Interstate Properties (which now controlled Vornado) and Donald Trump each bought approximately 20% of Alexander's, a failing retailer whose real estate holdings included its flagship store, occupying the entire block between East 58th and 59th streets and Lexington and Third avenues. In 1988, they each raised their stakes to 27% but Trump pledged his interest as collateral for a personal loan from Citicorp and in 1991, Trump was forced to turn over his holdings to the bank. That's right - the clothing store is now a real estate investment trust. Makes sense. Lot of good will in that name! People whose dads bought a suit at Alexander's would surely give them money to invest in real estate. 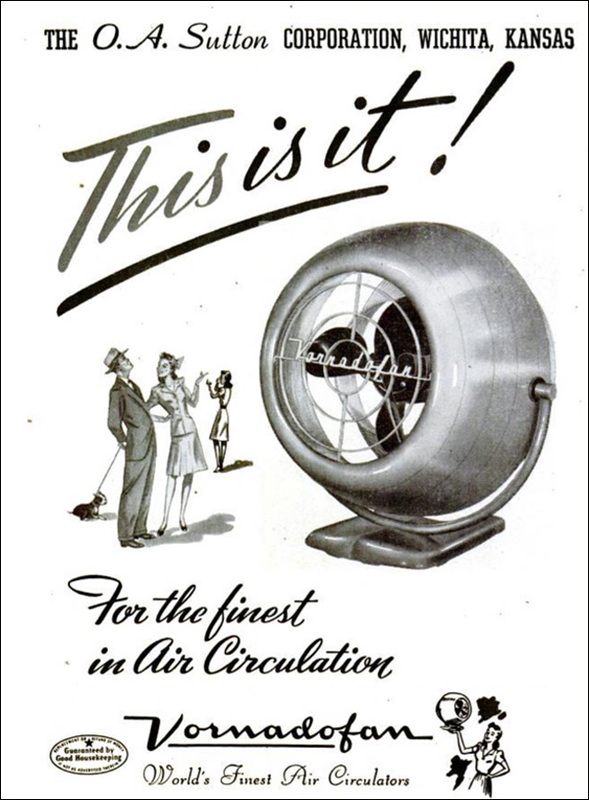 The current Vornado fan maker has no relation to the company, but they have licensed the name. 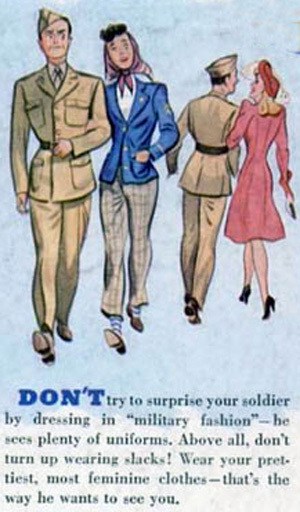 During the war, there was a particular shade of red used in the ads of Life magazine. 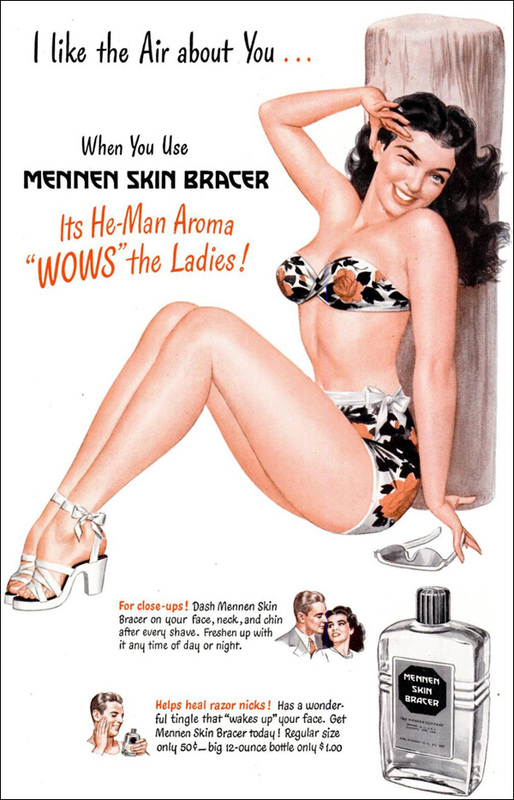 I don't know if they'd bought up an underground reserve before the war, or the military hadn't requisitioned it all for war duty, or whether that was just the standard way to spice up an ad that wasn't color and wasn't black and white. So Willie Whiskers was an alter ego? A hallucination? His true id self, now repressed by lather and blade?
. . . although she looks as if she's in the early stages of an all-over painful sunburn. You're not a woman-hating hermit, are you, mister? Okay then. You don't want "Athletic Aroma." You know what that is. BO + old jock strap. Best thing about this lotion you put on yourself? It's "harmless to skin and clothes." No more shirts eaten away! No more terrifying glimpses of muscle, tendon and finally bone as it dissolves your very flesh! High Fructose Corn Syrup, the early years. It's nothing but sugary corn sauce - and your family will love it. "Maple-y" means no actual maple. He was a gag writer and artist for early comic books by Centaur and National/DC, such as 'Alfy Elephant', 'Big Sid', 'Shocky Plus Gus', 'Ramblin' Jim', 'Slim Pickins' and 'Dare-Devil Dunk'. No, I didn't think so. There were a lot of those guys. Some sci-covers below - see you around! New podcast in a day or so, in case you're wondering.